Angola Caconda. 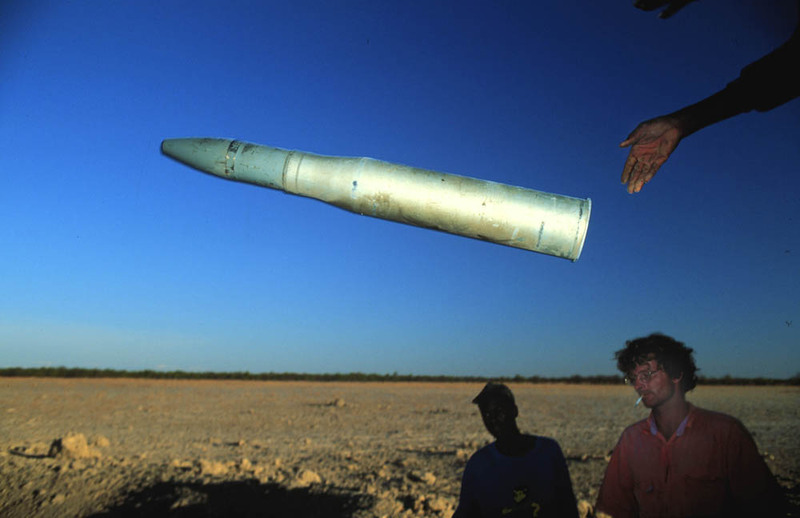 A PPM2 anti-personell mine, sticking out of the ground. 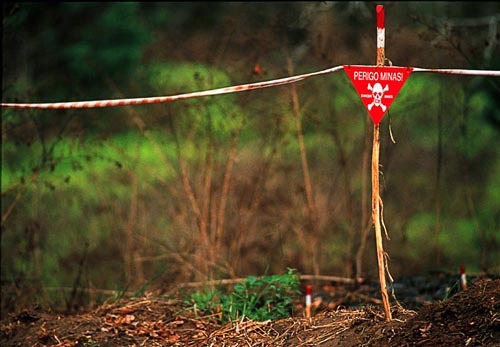 "Danger Mines" says the sign next a road near Ambriz, in N. Angola, where German Humanitarian Demining NGO, MgM(People Against Landmines ) are clearing mines, the pegs in the foregroung show where mines have been lifted from the ground. Muxualando Angola. 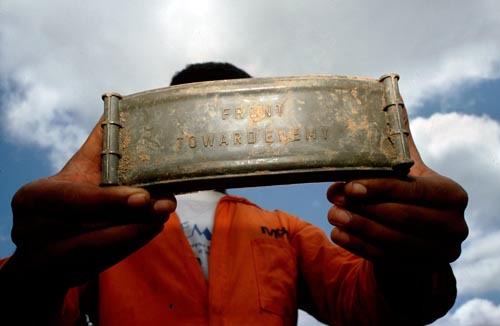 A sapper with Humanitarian demining organisation, MgM, or People Against Landmines, holds up a South African copy of an American Claymore, anti-personell landmine. On the front of this mine it says, "Front towards Enemy". 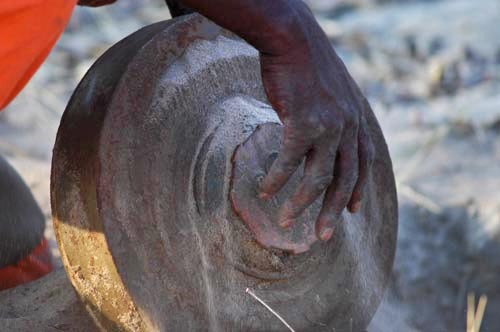 16 year old Arupa Bernard, who detonated an anti- personell mine which blew off one of his legs as he was going to the river to collect water, in the Kavango region of Northern Namibia. 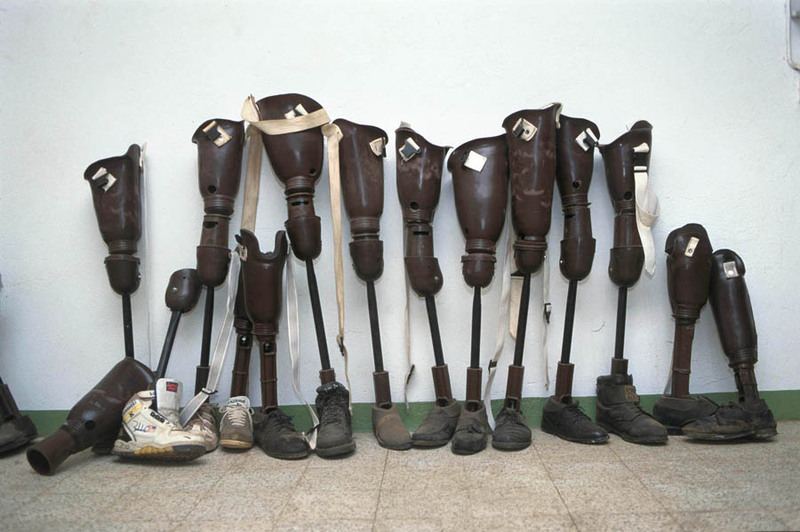 Prosthetic legs await their new owners, at a Red Cross Centre, in Luanda, Angola, where amputees and landmine victims are rehabilitated. 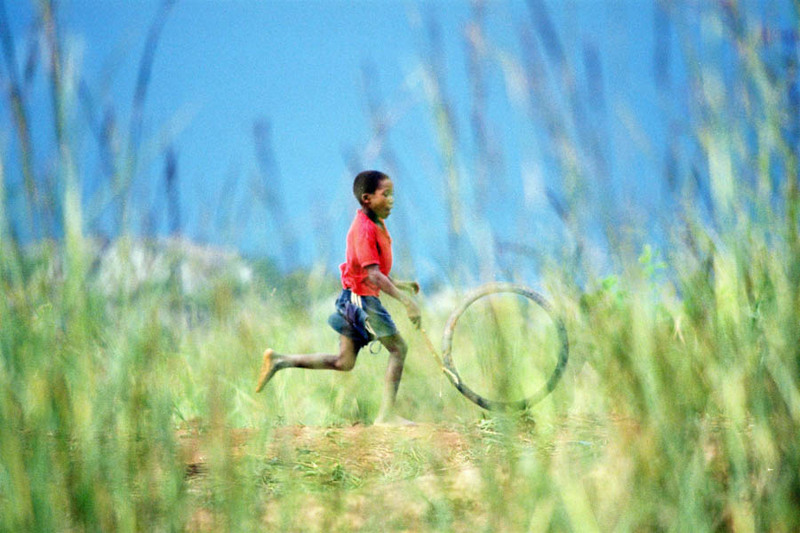 Angola Luanda. 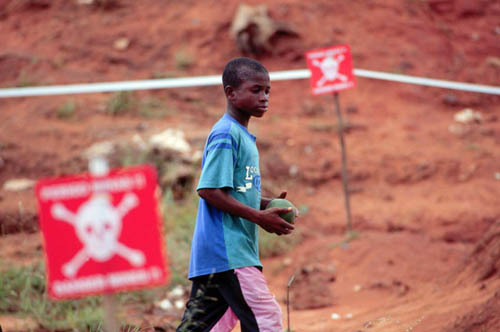 A boy walks on a path between two areas contaminated by unexploded ordnance, or weaponry, in Bairro Madiera, a suburb, close to the airport. Amgola Ucua. Sappers stand in a line in the area that the man in front has already gone over with his metal detector, in a suspect area, next to a road. Amgola Ucua. 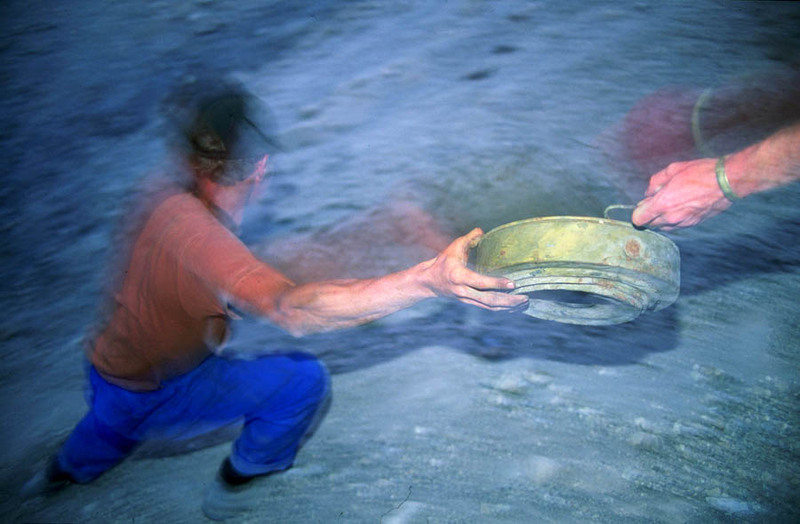 A sapper working for German Humanitarian Demining NGO, MgM (Menschen gegen Minen - People Against Landmines),busy with manual demining. 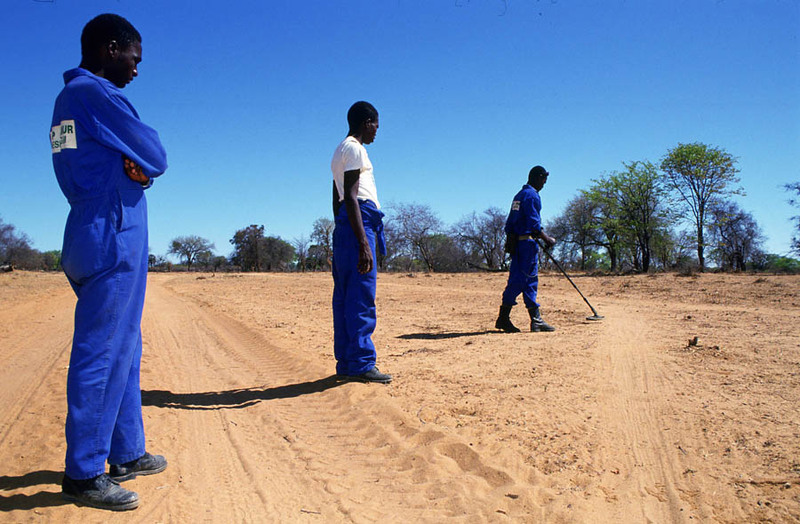 Manual demining is done here, with a sapper marking out a metre-wide lane, and using metal detectors, and sharpened metal prodders to clear his way along the lane. 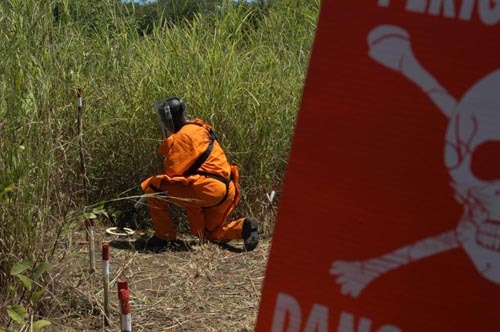 Clearing the landmines will allow the local populace to return safely to the area, and start agriculture. Angola Mulongo wa Shikongo. 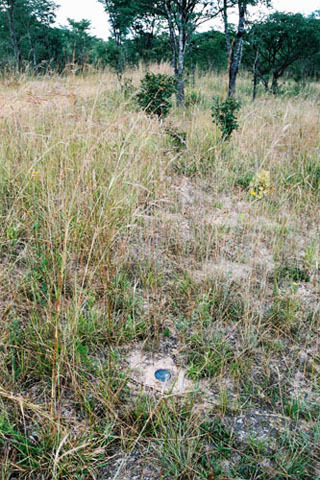 An anti-tank mine is removed from the ground by a sapper, working as part of a team to clear a minefield. Mines were laid in this border region, during conflict times, but now there are people living in the area. Angola Ambriz. 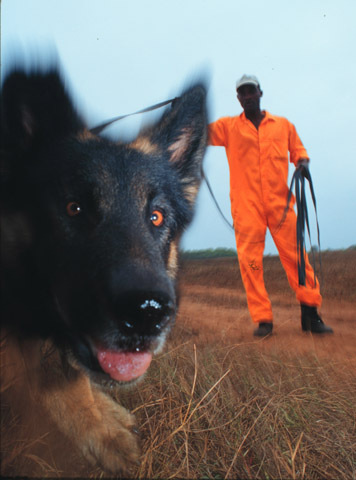 A dog, trained to sniff explosives, is taken through various exercises by its handler, before it joins the landmine clearing team. 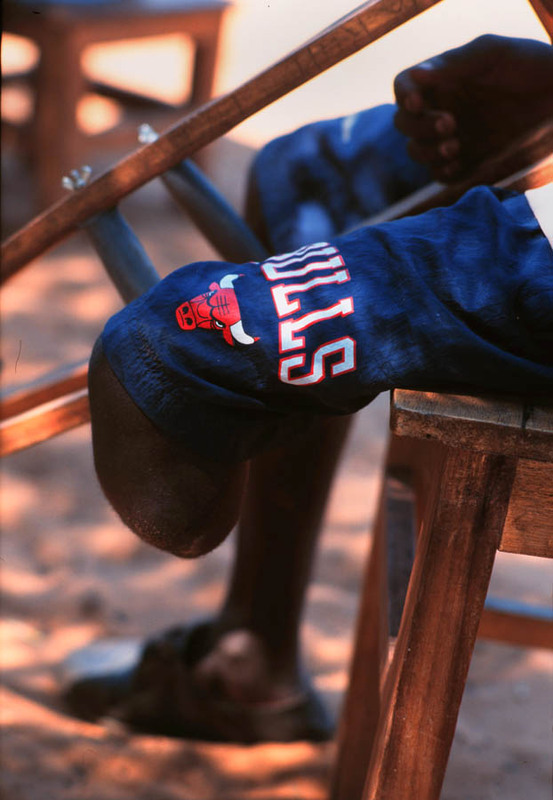 Southern Angola. 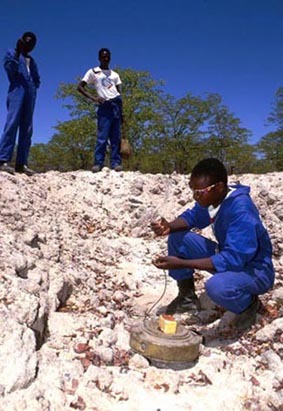 Sappers prepare to detonate an anti-tank mine near Xangongo, Ongiva. 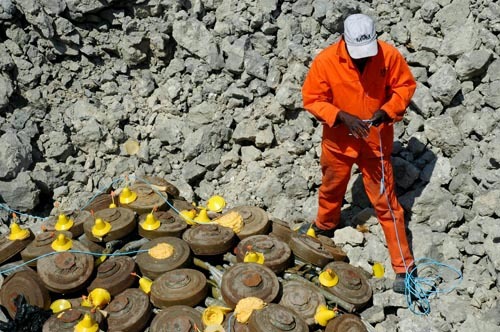 Cunene Province Angola.Sappers working forGerman humanitarian demining charity, MgM, Menschen gegen Minen,(People Against Landmines) carefully load about 500kg's of landmines, cleared from the area, as well as RPG and BM24 rockets into a pit, in the middle of a dry lake, called a shana. The weaponry is carefully packed to make sure that everything explodes at the same time. 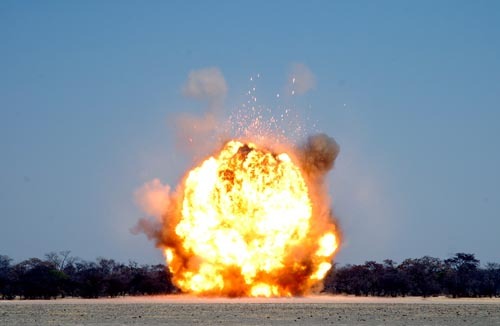 Yellow commercial plastic explosive is packed at strategic points, to which the blue detonation chord is attached.